I've seen something for the first time. The Dodgers are dancing in champagne and we're headed to the NLCS. Someone pinch me. Actually, don't pinch me. This is too enjoyable. 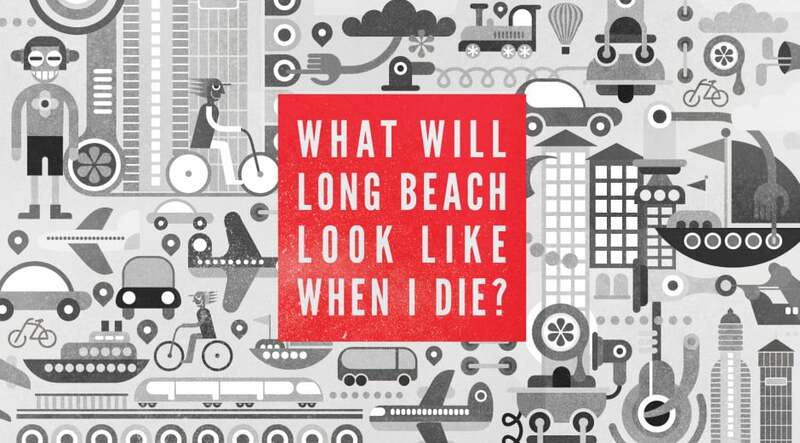 What will Long Beach look like when I die? Sounds like a morbid question, right? I promise you, it’s not that weird. Follow me for a moment (or three). I am proud to say that I am a newly minted Long Beachian. My family and I moved to Long Beach this past New Year—and we are loving our new city. As I meet new neighbors, walk through new neighborhoods, and ride new beach paths, I’ve come to realize there is so much vibrancy to our fine city. Don’t get me wrong: there is much that is broken but we can talk about that later. Over the years, it’s come a long way. I know we can’t dwell on the past, yet the stories of yesteryear teach us valuable lessons for our own future. On the other hand, our past does not, and should not, dictate the story of our future either. So, let’s flip back to those of us who live in the present. How would you re-imagine or re-think the future of Long Beach? What does your LB2050 look like? What will the faces of our great communities look like? What will our neighborhoods, streets, schools, businesses, health, or the arts look like? Will Long Beach become even more vibrant than it is today or will it find itself in a state of decline? Why do these questions even matter? I recently spent a large part of my career as a financial advisor. When meeting with clients, I found they usually came with the intent of setting a plan—a financial blueprint of sorts—to achieve their desired financial goals. Most of them grasped the industry adage, “People don’t plan to fail; they just fail to plan.” They understood that if they wanted their future to look different than their present, they needed a plan. The first step was always the hardest: taking inventory of the present. It was an very uncomfortable process looking at financial mindsets, spending habits, savings patterns, budgets, debts, and assets. After looking in one’s financial mirror, we would identify the goals that painted an image of their financial dreams. Accordingly, we would perform a series of analyses to determine how much their dreams would cost, and then, advise as them to which solutions would best fit their situation. Inevitably, it was a sobering moment when I would sit with clients and compare for them the costs of their dreams to the trajectory of their current financial behaviors. Most times, they were faced with one of two choices: they could either change their financial behaviors to accomplish their long term goals or change their goals to match their behaviors. The best clients were those who had a burning desire to affect the trajectory of their financial futures. The connection between individual financial futures and Long Beach’s future isn’t immediately apparent, but it’s there—and it’s there through the lens of a project in Los Angeles. I recently came across LA2050, an initiative led by the Goldhirsh Foundation to “create a shared vision of the future of Los Angeles and to drive and track progress toward that vision.” When you read the LA2050 report, you can sense the conviction that the citizens of Los Angeles County possess a powerful capacity to produce ideas, to innovate, and to collaborate to affect the future form of the region. LA2050 introduces the initiative in its report by telling the current story of Los Angeles. From a holistic perspective, it uses eight indicators to measure the vibrancy of the region: education, income and employment, housing, health, environmental quality, public safety, social connectedness, and arts/cultural vitality. A dashboard was created to describe how each of these eight indicators would impact human development if the current trajectory is allowed to progress unchanged. This is what LA would look like in 2050 if we fail to plan. All I could think about when I read this report was, “Yeah, this is a great vision for the LA Region and I look forward to being part of it, but was about Long Beach specifically? What can we do to make Long Beach the best place to learn, create, play, connect, and live? In 2050, the LBUSD will be the highest rated urban public school district in Los Angeles County. High school graduation rates will skyrocket from an average of 80.6 percent (2013) to 95 percent, and the Academic Performance Index (API) scores will rise from an average of 783 (2013) to 900. STEAM (Science, Technology, Engineering, Arts, and Mathematics) programs will be a staple of all school preparing next two generations of students for a creative economy in 2050. All students will have access to high quality pre-school and after-school programs, public-private partnerships will flourish, and the rates of parent engagement will be high. In 2050, Long Beach will be described as one of the top ten cities in America to find work. Unemployment numbers will drop from 11.9 percent to five percent. The number of underemployed residents, or percentage of people living in poverty, will plummet from 22.8 percent to ten percent. While we can boast of nearly 210,000 jobs in Long Beach today, it will increase to 300,000 by 2050. However, the types of jobs we create are just as important as the number of jobs we create. Currently, 8 of the 10 fastest growing jobs in the region result in annual salaries for households living in poverty. In 2050, we will to create the right kinds of job; jobs that are knowledge-based. Our efforts to create jobs will not only be focused on attracting large companies to Long Beach, but also to grow of our workforce organically through the cultivation of a creative economy. This entrepreneurial environment will be home to Bootstrap Beach, a new mecca for technology and creative based startups. In 2050, Long Beach will be a shining example of how to provide housing that is affordable and available. Today, nearly 130,000 of Long Beach’s spend more than 35 percent of their income on housing. Affordable housing is defined that which requires less than 30% of a person’s income. For example, in the Downtown area, a two-bedroom apartment would require a household to earn a salary equal to almost three times minimum wage earnings. The City of Long Beach has allocation of over 6,000 Section 8 vouchers with over 4,700 qualified families. The devastating news is that there a closed waiting list of over 10 years long for families seeking affordable housing. In the last ten years, more than 2,000 housing units have been developed in the Downtown area with another 600 or so planned over the next several years. This is good news, but this doesn’t necessarily make homes more affordable or more available. Developing more housing options for the middle or upper classes may increase median housing prices and housing units, but unless affordable housing is provided, our current problems will only increase. In 2050, there will more mixed-use, mixed-income residential communities which will result in 10,000 additional units being developed to ad to or replace the existing housing stock. They will be the result from cross-sector partnerships which will innovate to find solutions to overcome all constraints; market, governmental, and infrastructure and environmental. In 2050, Long Beach will be known as the most bikeable, most walkable, and the most playable large city in the United States. Currently, Long Beach is ranked the 11th most walkable large city in the United States; New York sits as the leader. The city is also ranked the 11th most bike friendly city behind the leader, Portland. In terms of open space, the three easternmost zip codes (90808, 90815, 90803) have almost 2.4 times the amount of green space as the other eight zip codes combine. The most extreme disparity come between 90808 (19.21 acres/1000 residents) versus 90813 (0.26) which is a ratio of 74:1. In order for Long Beach to achieve these goals, policies, funding, and again, public-private partnership must be set in place. It takes an investment over the long haul. Portland is the most bike friendly city today because it began developing this ecosystem thirty years ago. In 2050, the residents of Long Beach will be more social connected in the areas of voting and volunteerism. Let’s face it, there is no amount of policy, infrastructure, or funding that will make LB2050 than LB2014 with social connectivity. The citizens of Long Beach will have a higher rate of voter registration, voter turnout, and volunteerism. The design and development of LB2050 must not just come from its leaders, it must be derived from its citizens. Voter turnout will increase from 14.2 percent to to the national average of 41.8 percent and the rate of civic and social engagement (volunteerism) will reach the 30 percent mark. Change doesn’t begin with anyone else. It begins with me and it begins with you. Now, allow me to wax poetic for a moment. With this inaugral post, I am sounding a call; the kind of call you see in movies where a giant horn a la Ricola commercials is blown to awaken an army into action. This is a challenge to all citizens of Long Beach who have an interest in what our great city will look like in 2050. The crafting of a vision for our future should not only fall upon the shoulders of our elected officials. While they provide vision, leadership, policy, and mechanisms to shape our future, it is by its citizens—individuals, affiliations, and institutions that cities are remade. Every citizen—regardless of race, creed, sexual orientation, socio-economic status—has a place at the drawing table to design and shape our city. It is the place where our families will grow, live, work, play, and worship. It’s okay to be content with its current condition, but if we don’t take an initiative, neglect will lead to decline. So, let’s imagine a greater future. LB2050 can begin by taking inventory of what and who Long Beach looks like today. Let’s come together with a bottom-up approach to determine our dreams. Let’s count the cost of what it will take to build that future. Let’s dream, let’s plan, let’s collaborate, let’s act. Let’s make it happen. To all the citizens, innovators, artists, faith leaders, elected officials, entrepreneurs, educators, journalists; let’s come to the drawing table. Are there institutions or philanthropists in Long Beach who would be willing to lead and finance LB2050? Are there citizens at all strata who are willing to be part of this conversation? Who would be willing to lead from a board or committee, voice their opinion at a community workshop, commit to action steps, and ultimately, be part of Long Beach’s future today? Who’s in? If this sounds like you, I’d like to hear what you think. LB2050: for the good of the city.